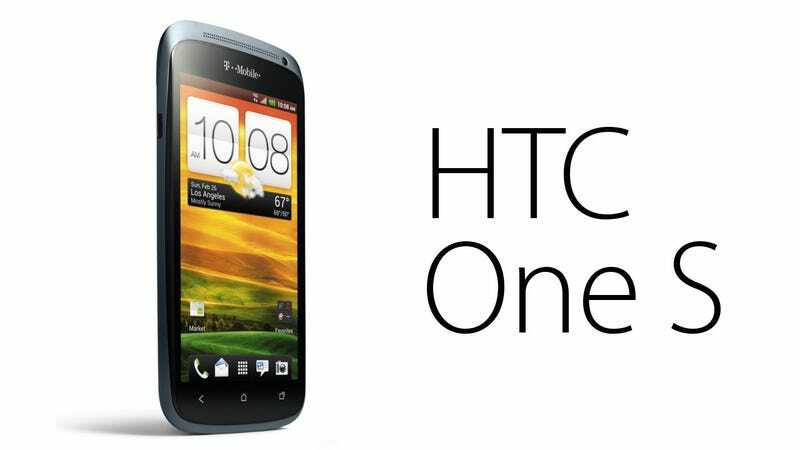 While the One X may be HTC's beast of a flagship device, the One S is not far behind. It's packing a new Snapdragon S4 processor into one of the most solidly built phones I've ever put my paws on. First off, the One S is similar to the One X in many, many ways. Same software, same crazy camera setup with a dedicated image processor, NFC, free Dropbox space, all of that. Read the One X hands-on for more details on that stuff. Now let's get into what's different. The body is fantastic. Snap impression: my favorite-feeling handset ever. It has an aluminum body that has been put through a multi-arc oxidation process. This gives the aluminum ceramic-like qualities. It was super light, but felt incredibly strong, and it had a really nice "soft" texture to it that isn't going to be a finger-print magnet. Also, at only 7.9mm thick, it's one of the thinnest smartphones out there (the iPhone 4S is 9.3mm, to give you some perspective). The screen comes in at a now-fairly-standard-for-Andriod 4.3-inches, which is a pretty nice size, but unfortunately its takes a step down in resolution and quality from the One X's 720p Super LCD2. The screen on the One S is a qHD Super AMOLED display, which means a resolution of 960x540. That gives it a pixel density of 256ppi vs. 312 one the One X. That said, Super AMOLEDs have really deep blacks and vibrant colors. The other major differentiator here is that it's powered by Qualcomm's new dual-core Snapdragon S4 processor, instead of the quad-core Tegra 3 on the One X. While the two fewer cores may be a disappointment to some, I didn't see any lag or hesitation during my brief time with the phone. Actually, it seemed extremely fast. It's clocked to 1.5GHz and it tore through the UI (Android 4.0 Ice Cream Sandwich with HTC's new and seemingly not horrible Sense UI on top). Qualcomm has been trumpeting the S4's power managing ability and performance, so we'll just have to wait and see. We do know, however, that it will work with the HTC MediaLink I mentioned in the One X hands-on, which allows you to beam 1080p video and HD audio to your TV. This is going to be a global phone, but it will be coming to the U.S. within the next 60 days. T-Mobile will be the first carrier to get it (yes, with 4G), but it may not be the last. No word on pricing yet, but it probably won't be as expensive as the One X. Yes, it's not quite as exciting as its big brother (on AT&T exclusively), but it's still very tasty indeed. Can't wait to test it. I also got to spend a little time with the One V, which is the low-end model in the One series. It has a 3.7 WVGA Super LCD, and a single-core 1GHz processor. While it only has a 5MP rear-camera, it has the same image chip and optics as the One X and One S which will probably allow it to take decent enough photos. Also, significantly, the software is the exact same, too. Android 4.0 Ice Cream Sandwich with Sense 4.0, which is nice to see in an entry-level device at launch. The One V feels solidly built with its aluminum frame, and they brought back the chin on the lower-part of the phone! (Cue nostalgic sigh from first gen Android users). The phone definitely felt slower in comparison to its siblings, but for an entry-level device, you could definitely do much, much worse. No word on pricing, but it should also be out in the next 60 days. UPDATE: Unfortunately, I was given some inaccurate information from HTC. The One S does not have NFC capabilities, which is really a shame.